Gov. 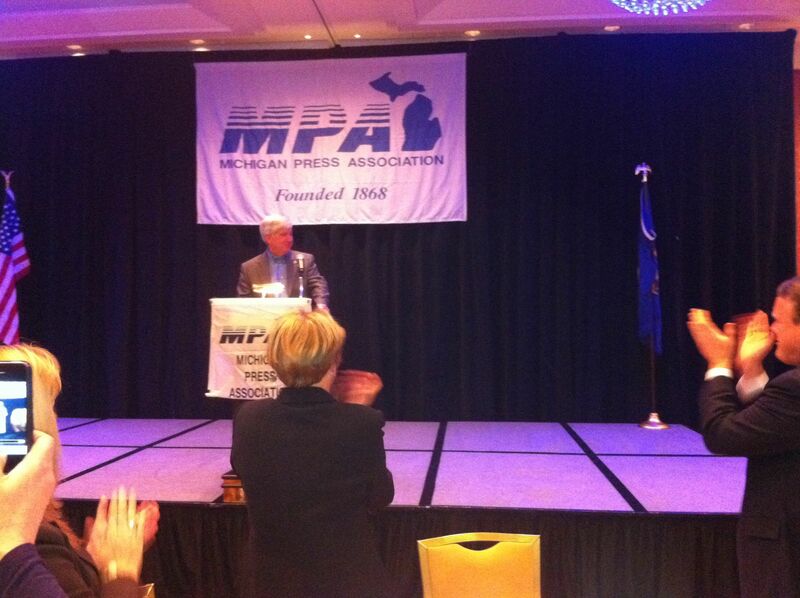 Rick Snyder was the keynote speak at the Michigan Press Association conference. 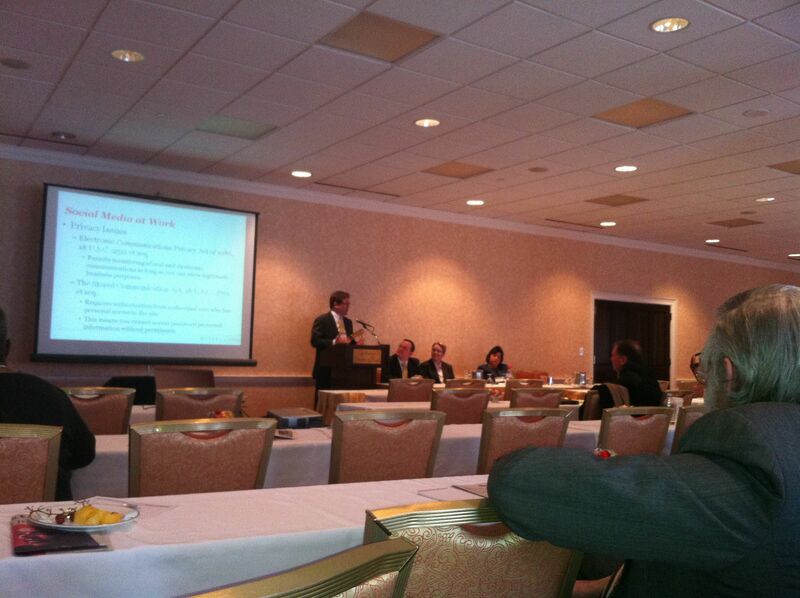 Journal Register Company’s own Rick Kelley was among the panelists speaking on social media. Resch referred the audience to “Social Media is a Cocktail Party,” written by a social media consultant who advises large companies on social media efforts. The book explains how people use it and interact with it. The book notes a lot of simple rules: The party will go on whether you are there or not and the same is true with social media. It will go on whether you decide to be part of the conversation or not. You first get to “the party,” listen and see where you fit in. Jump in and speak in circles where you feel comfortable. Don’t be slick or fake, because people can sniff it out and walk away. News media is the content provider. Look at Twitter or Facebook pages and they have links and topics coming from content providers, Resch said. Social media strategy important, panelists say. How has audience influenced how you have inserted social media in your business plan. Kelley said we have two audiences: print and online. Knowing we have two audiences allow us to do a better job of targeting. Look at platform demographic, not just age demographic. It’s about engaging the audience through social media. Facebook polls allow topics and questions to go viral. Find comfort level of readers. Ask people to “like” you. This will drive you to top of news feed. Resch asked who owns social media accounts: news organization or individuals? Kelley says the law is not keeping up and it will be a major issue as case law sorts out this and other related questions. Tweeps follow you for a particular reason: They find value in what you’re tweeting, whether news links or particular interests or insights. Panelist notes that the beauty of social media is held in transparency. It’s evolving and moving faster than we can keep up with. One panelist says business owns its account but individual accounts held by the individual. Twitter account Panelist Kate Jacobson, editor in chief at Michigan State University’s State News, says it’s fun to produce multimedia journalism — to do audio, video, social media, use smartphones in the field while posting breaking news. Multimedia element should be different than story. Don’t repeat the story. Should be a sidebar of sorts, Jacobson said. Let people behind the scenes to see how the newspaper industry works. Let them into your editorial meetings. It’s about transparency. A lot of people don’t understand their privacy settings. People need to learn about privacy issues on social media, one panelist said. Community Media Lab and citizen journalists discussion prompted by Kelley brought some questions from the audience about libel and potential lawsuits when you’re dealing with people who are not trained journalists. One audience member said she thought in the future it will be the citizen journalists who will be held liable, not the news organization, just as bloggers are responsible for their content. Spotify playlist for local musicians; fashion editor should have an account on pintrist; photographers should shoot behind-the-scenes photos using smartphone and upload to Instagram. These are social media tools and they are designed for sharing. Suggested staying active on Twitter. You can create filters on TweetDeck to customize news feeds. 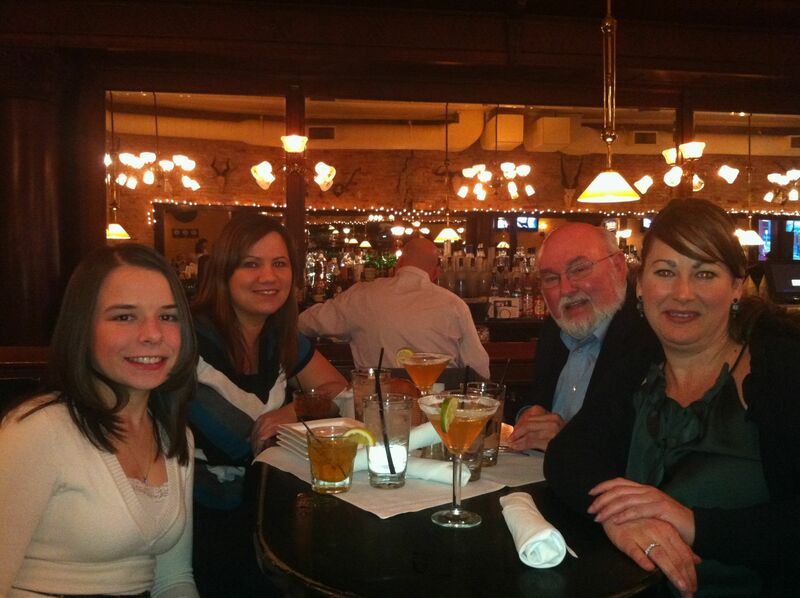 Note: This is a live blog post and notes from the Michigan Press Association convention. Follow live tweets at #mpa2012. It has been about six years, but I am finally back. And a lot has changed in the industry since I last attended the Michigan Press Association’s annual convention in Grand Rapids. I am ready to learn some new techniques to apply to my craft, and I’ve brought two colleagues along for the ride. Heritage Media-West reporter James Dickson and copy editor Tanya Wildt are with me after making the 138-mile trek from Ann Arbor at 5:30 this morning. Our first session, hosted at the spectacular Amway Grand Hotel, is “The Shape of Things to Come,” and the presenters are current and former college newspaper editors, and the talks is being moderated by Joe Grimm, professor at Michigan State University, who was introduced by Ken Winter, North Central Michigan College and Michigan State University Journalism School instructor, consultant and Petoskey News-Review editor and publisher. Listen to the talk here. Do you think of print or digital when you think of a job in journalism? This was the first question posed to the student panel. Kelsey Schnell says, “Yes, I will work online,” notes they’re talking about eventually ending print edition of student newspaper. “Ideally, I’d like to stay in print, but I guess I will go where the job takes me,” says Mike Martinez. How and where do you get your news? The second questioned posed to the panel: Mostly online, phone, through news apps; Twitter and picking and choosing what’s interesting. Poll: How did you find out Michael Jackson died. Many heard on television, from radio, Twitter, Facebook and print. Make sure to fact check Twitter reports. Important to uphold standards of journalism. Example, how it was tweeted that former Penn State University football coach Joe Paterno died before he had. Student editor suggests write a 200-word preview with a photo and put it online, and response from audience will tell you whether to write a followup and produce video, possibly write a column. Let the audience help steer your efforts. Don’t waste time on a story about something no one or very few care about. It’s important to know your readers, market and demographics. Serve both print and online readers, and cross promote everything. Question from the audience: When is the last time you used a phone (to do an interview)? “It’s still old-school journalism in this new realm,” Kate Jacobson says, stating she prefers phone or in-person interview over email. Don’t let people hide behind technology and craft carefully-considered answers. Journalists want authenticity. Jacobson: MSU State News seeing a shift to online advertising and it’s “pumping serious gas in our car.” Print is down to six pages because print advertising is down. Subscriptions help a little bit. What alerts do you have out there to get the news, Grimm asked. “Hard news matters.” More students interested in writing features. News aggregators like Gawker, Google and Yahoo have good news alerts, pulling from a variety of websites. Gawker has clever writers who aggregate content. Most news originates from websites. In the new world, students were asked, “What will people pay for?” Students “don’t like paying for stuff.” Students willing to pay for some news content if it’s exclusive content and just what they want. One student pays for ESPN sports. He pays for small-town news because it’s not as shared on social media and those subscriptions are reasonably priced. Long-format writing, one student pays for. Has had a subscription to Esquire since he was 15. Some college newspapers hoping to monetize Twitter stream by putting ads in feeds. Thoughts on local community journalism. How do we build community and conversation like our local newspapers have done. Students say great thing about social media is community can share content, comment on content on social media. This builds community and conversation. One student’s parents didn’t renew subscription because the newspaper isn’t “fun” to read anymore because it got so whittled down as advertising support dropped off and pages were cut, limiting local news coverage. Michigan Gov. Rick Snyder answers question of Eastern Echo reporter at Michigan Press Association convention.